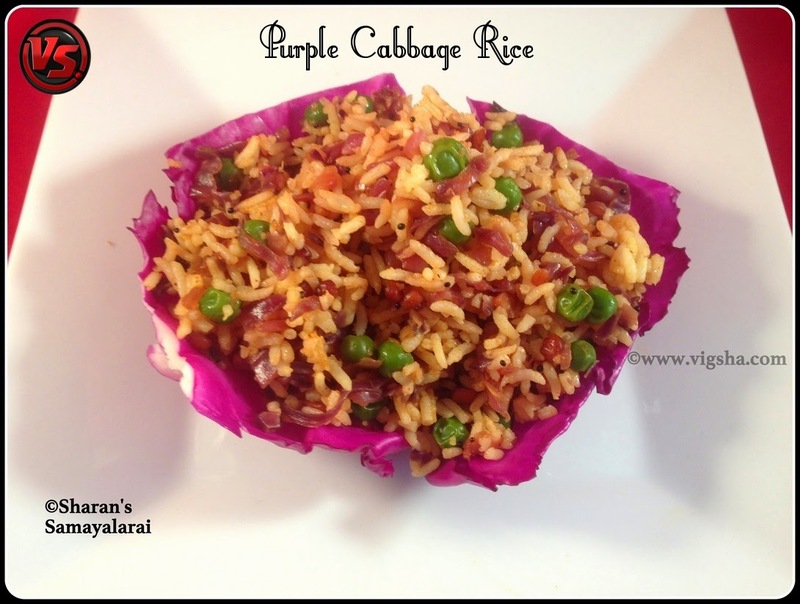 Purple Cabbage Rice is a simple variety-rice which is a quick fix for lunch box. It surely is an unique recipe which can be prepared simple, when you feel lazy to cook an elaborate meal. I usually buy this purple cabbage for salads as it makes it colorful. But this time I tried it an Indian recipe and it tasted delicious. While cooking this cabbage the color goes to light purplish and it fades more as it rests. 1). Wash and chop/shred the cabbage finely. Cook a cup of rice, then add a tsp of oil so that the grains are separate. Keep aside. 2). Heat oil and let mustard splutter. Then add urad dal and channa dal and saute till turns golden. Then add onions and surry leaves, saute till onions turns translucent. 4). Cook covered till the veggies are fully cooked (without adding water), keep stirring occasionally. 5). 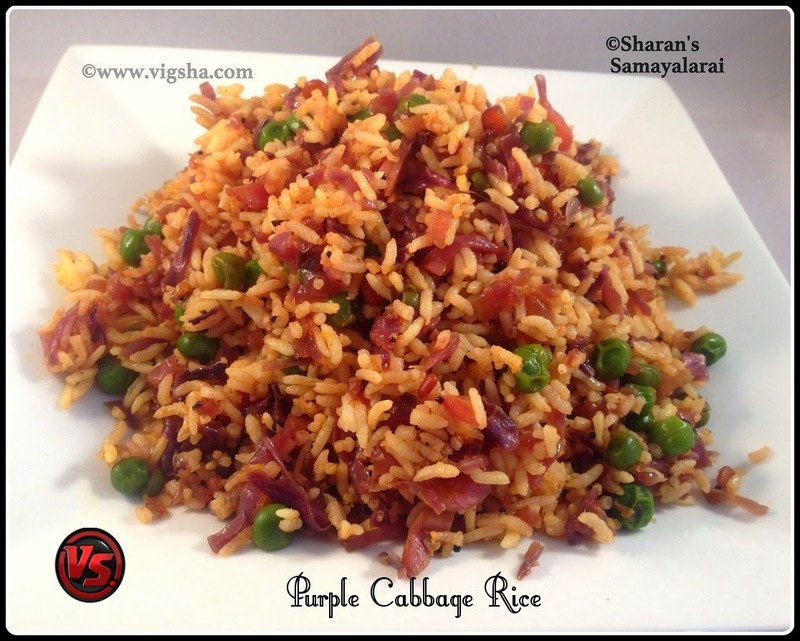 Once the cabbage gets well-cooked, switch of the flame and add the cooked rice. Toss everything gently without mashing the rice. Finally sprinkle lemon juice and coarsely grounded peanuts, give a quick stir. Check for salt and adjust accordingly. Done ! Pack for lunch box and enjoy with with some chips or raita. # You can include any veggie along with cabbage. I have used purple cabbage but you can follow the same method for normal cabbage. # Toppings (coarsely grounded peanuts and lemon juice) are optional. It tastes good even without the toppings.